Hands up if you’ve ever tried to arrange coals, handle food or rearrange logs with a regular pair of cloth oven mitts you found in a kitchen drawer. If you’re like me and were dumb enough to try this, chances are you burnt your hands to hell (and probably pissed off the wife when she found her singed mitts). A good pair of bbq gloves is a vital part of your arsenal. From arranging coals, to handling hot food, you want to protect yourself. Not all gloves are created equal though. With a range of fabrics and lengths to choose from how do you know which is the best one to buy? 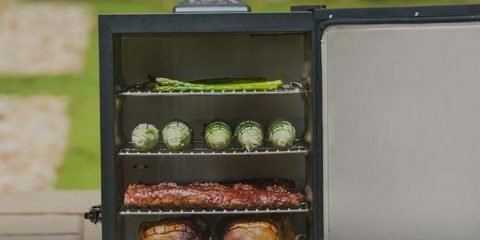 We’ve narrowed down the best insulated bbq gloves for you so you can spend less time nursing blistered fingers and more time sucking ribs sauce off ’em. Why not just use tongs? These gloves are lightweight, flexible and heat resistant up to 932° F. Made of protective Aramid fibre that has been coated with silicone strips, these gloves give you the best of both worlds. We haven’t heard of Aramid fibre before either (don’t pretend you had!). Essentially it refers to the heat mitigation technology of modern synthetic fabrics that can keep your hands safe in super hot conditions. At the same time you get extreme grip from rubber like silicone. 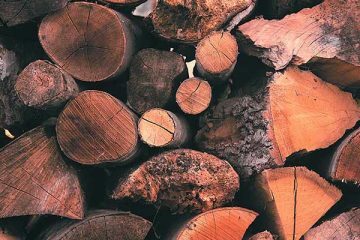 Meaning you can handle burning logs, shift around charcoal or touch hot food without having to worry. Unless you moonlight as a superhero, you won’t encounter anything too hot for these gloves to handle. The tightly woven fibre distributes heat very effectively across the glove so no matter what you grab, you won’t feel it, and the fabric fits snugly around the wrist. This is also the only glove on the list that is cut resistant. Meaning you can go about your work knowing you’re fully protected. The only drawback is that because of the fabric used in the gloves construction, they aren’t waterproof. Anything more than a few tablespoons of liquid will soak through and decrease their heat resistance. We suggest you sticking on the cautious side with these gloves. Even steam can lower their thermal resistance, causing you to burn your hands. The fingers on these gloves also run a little large, so if you have small hands you might want to consider something else. These insulated grill gloves from American company The Pit Glove do a great job at balancing comfort and dexterity with extreme heat resistance. The outside has a premium neoprene rubber coating which is great for water resistance including grease or steam. The glove itself is knitted and has a soft jersey cotton liner. This combo gives you more flexibility than you get with silicone while still keeping your hands safe from burns. The gloves only come in size 10/XL and the assumption is one size fits. If you have extra large or small hands you might want to consider another glove. 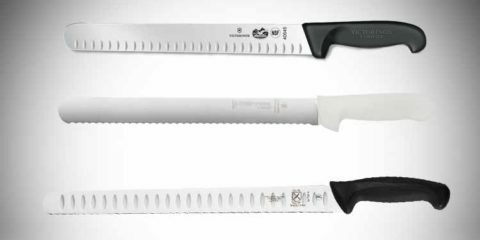 At 13″ they sit high enough above your wrist so that you do not need to worry about getting burned when reaching in to your grill, or smoker. The neoprene coating provides excellent grip. This grip extends up to the wrist line but at this point, grip is not required. The gloves are also easy to clean, which is handy for grabbing meat off the grill. When you’re done using them, simply wash them in the sink with your gloves still on with hot water and soap. When you wash these a bit of dye might come out, so wash them on their own and avoid ruining other clothes. You get a 3 month guarantee. Not the longest out there but enough time to get your money back in case anything is defective. Just like the Ekogrips above these gloves are made from heat resistant silicone. With a similar max temperature of up to 442° F, these gloves can be put through the dishwasher and perform OK under wet conditions, at the expense of dexterity though. You can choose between S/M, L or XL, and these gloves seem to run a bit large. We suggest sizing down. And if you’ve got smaller hands then the bulk of these gloves may make it more difficult to grab items or perform tasks like basting a brisket with these gloves on. You also need to be careful not to turn the back of the glove towards the source of heat, as the textured part on the front helps protect your hands. The lifetime replacement guarantee is also a nice bonus for a bit of added piece of mind. 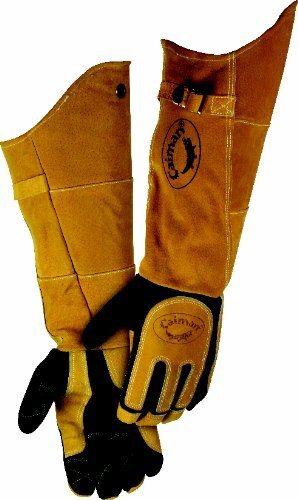 Any bbq glove made from genuine American deerskin with a boarhide heat shield and cuff was always going to get out attention. While the glove is marketed as a welding glove, we find that welding gloves make some of the best general purpose gloves for outdoor cooking and fire management. The folks over at eggheadforum.com agree. “A good set of welding gloves is what I use, however you don’t want to hold on to a hot plate setter (or a hot anything, for that matter) for very long!”. The leather gives you good initial protection and the length of the gloves helps to ensure your wrists and arms stay protected. Unfortunately the leather is also not the most heat resistant fabric. Fine for most tasks you’ll encounter while smoking but just watch out if you’re holding on to something hot for more than a second or two. You’re going to be paying a premium for the premium materials so if you’re on a budget we say look elsewhere. If you want something more luxurous, that will impress your buddys as well then these gloves are perfect. And who knows, you might even get some welding done while your brisket is stalling. Heatproof up to 425° and made of water resistant silicone these gloves offer excellent grip at a similar price point as the previous gloves. What you give up in temperature resistance, you gain in versatility with the ability to handle liquid and steam. For true barbecue gloves we would like to see higher heat resistance. 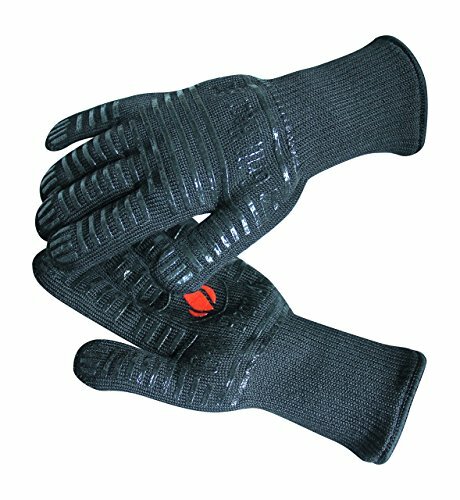 These gloves are not ideal if you need to handle a lot of charcoal or burning wood. Charcoal and embers can easily exceed the maximum heat range, meaning that handling them can be dangerous. The area around the wrist is also on the loose side, so radiant heat can find its way in, potentially making things uncomfortable. If required they can either be wiped clean or placed in the dishwasher. The waterproof benefits of these gloves are balanced by the fact that you lose some of the dexterity you have with fabric gloves. Fabric gloves provide much more dexterity and are far more comfortable than these gloves. 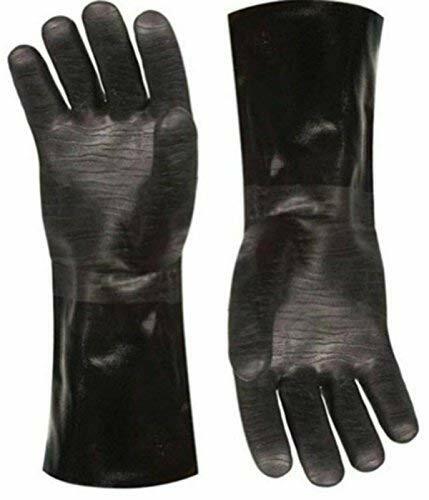 But if you don’t want to worry about getting steam or water on your hands and aren’t planning on handling a lot of charcoal these gloves will perform for you. 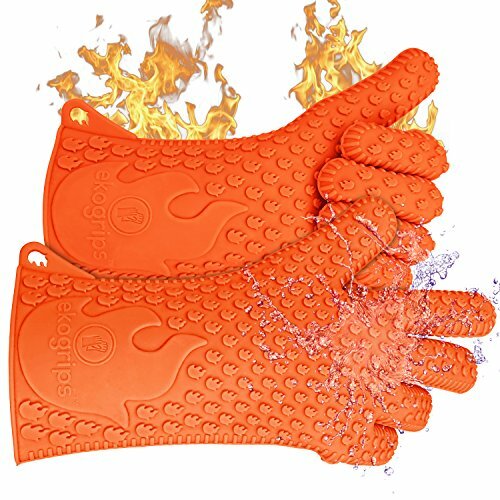 For the best of both worlds, consider buying a pair of Ekogrips bbq gloves for handling food around steam or water, and grab the Extreme Heat Resistant grill gloves for anything really hot. You should be able to find a great pair of gloves from our list above. There’s a lot of different gloves out there though. And they’re all of varying quantity. Here are some of the gloves we looked at that are worth considering. Steven Raichlen Insulated Food Gloves – Better known for his excellent book Project Smoke, Steven Raichlen has thrown his hat into the bbq gloves ring. Personally we’re not a big fan of the grey appearance, but looks aren’t everything so we had a deeper look. Turns out that these gloves can get rather slippery (not ideal for handling greasy meat), and they can stain. We would recommend going for a glove with a bit more grip / texture, but the gloves are otherwise well liked among the smoking community, and are a good buy if you can get them on special. Get the latest price. 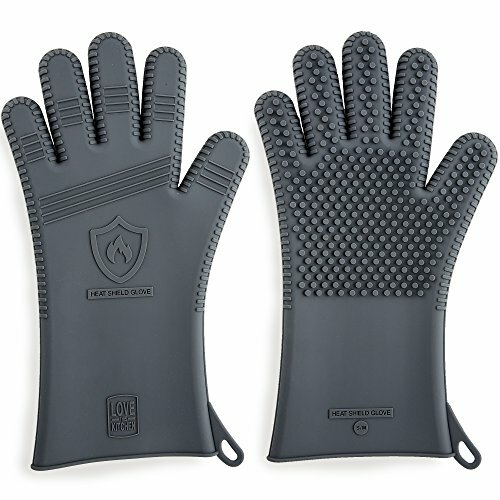 G&F Premium Grain Leather Gloves – These are a good option if you want to go down the leather glove route. The 14.5 inch sleeve provides decent protection, and 100% genuine grain cowhide is nice if you prefer to stick with natural materials. You’ll need to be pretty careful with these though, and we don’t think it’s worth the added worry when a pair of silicon gloves can give you better heat protection. If you’re really set on leather gloves though this is a great option at a good price point. Weber Premium Barbeque Glove Set – Normally anything by Weber would be at or near the top of any best of list on this website. That’s not to say these gloves are “bad”, but we’re not convinced it’s worth spending the extra money for this premium brand. Like everything by Weber, these gloves are built well and do the job, but there are a lot of other manufacturers selling similar gloves for much cheaper. If you want the peace of mind that comes with buying a known brand like Weber, then these gloves will still work great. The recommendations made in this guide assume you’ll be using these gloves for smoking meat. While not as dangerous a job as welding, there are still many times during a long smoke when you’ll need to protect your mits. From handling a chimney starter full of hot lump charcoal, to rearranging coals, adjusting air vents to finally pulling your meat and foiling it you need to have versatile bbq gloves to protect your hands. While we’ve focussed on using them for barbecue, the gloves we’ve selected are also ideal for seasoning cast iron skillets, grabbing hot pans, pulling candy or taking things from the oven. This is a legitimate question, that we should get out of the way now. Tongs alone can be useful for moving coal around or knocking an air vent closed. But you don’t want to rely on a pair of tongs to pull a 12lb brisket off the smoker (good luck balancing that!). Trying to move food off the cooking surface could end up with things falling apart on you, or with you burning yourself. 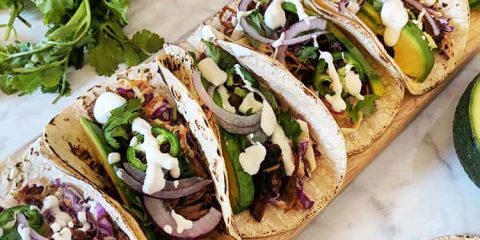 Common kitchen tongs aren’t long enough to protect your hands so consider also grabbing a pair of 16″ grilling tongs to give yourself some extra reach. Use both gloves and tongs, and make sure the gloves you purchase are rated highly enough to protect you. 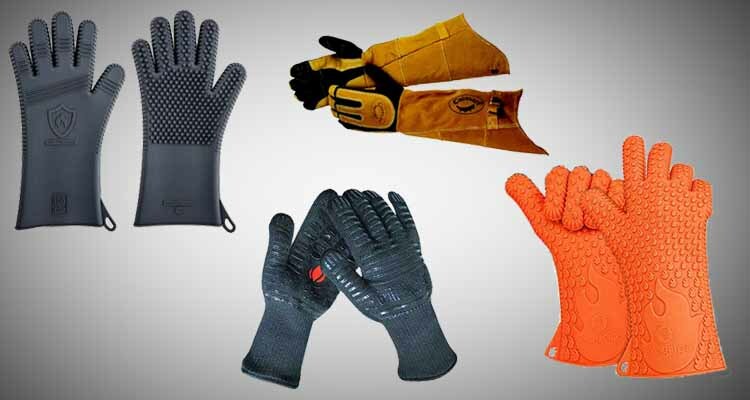 When deciding which gloves would be best we considered the needs of an outdoor chef, and narrowed them down to several questions that apply to a variety of situations. Does it cover the wrist? So you’ll still be protected when reaching into a smoker or across hot coals. Do they offer good dexterity while still protecting you from extreme heat? And can you use tongs or a thermometer with the gloves on? Do they stain? And how easily can they be cleaned? Is the overall appearance a pleasing one? There are several materials that heat resistant gloves can be made from, each with their own positives and negatives, to further illustrate the reasoning behind our choices for the best glove. We will explain each one in detail below. A rubber like material with a varying degree of industrial uses, silicone can be found in everything from bathrooms to computers. Depending on its thickness and density silicone can be fire retardant. It’s incredibly malleable, often 100% waterproof and can be wiped clean or placed in the dishwasher if desired. If you’re looking to take boiled eggs out of the pot by hand, silicone is your best choice. But silicone gloves are usually loose around the wrist, meaning radiant heat can enter in, often defeating the purpose of the glove in the first place. They are typically bulky as well, making it difficult to perform precision takes such as using a thermometer while wearing them. Finally, if silicone gets greasy it becomes very slippery making it difficult to keep a grip on anything. Grabbing ribs, brisket or any meat can turn into an exercise in balance, risking hours of work in the process. Aramid fibres are a class of heat resistant, synthetic fibre that are widely used in firefighting, the aerospace industry and for various military applications. They are used in ballistic rated body armour, composite materials like kevlar and as an asbestos substitute. Aramid fibre can be broken down into two characteristics, Para & Meta, each with their own strengths and weaknesses. For the purpose of heat resistance they are by far the best choice. At their highest degree of production quality they boast a low resistance to abrasion, continued fabric integrity at high temperatures and a non existent melting point. There is a reason why firefighters don’t enter burning buildings dressed head to toe in silicone, but rather in Aramid fibres. It’s simply the superior choice when it comes to heat resistance. It’s drawbacks are the price of production and it’s lack of water resistance. But for our uses and many others it is the ideal choice. 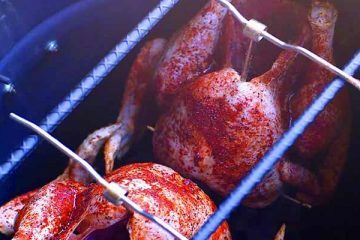 While they are fine for most barbecue or grilling tasks, you need to be careful not to hold onto a cast iron grill for too long, or when moving around hot coals or logs. We’ve also heard cases of the gloves shrinking. Leather is often referred to as a living material which requires more care and attention, so if you want a glove to use and then throw in the dishwasher we wouldn’t recommend a leather style glove. The glove market is a saturated one. With each company throwing out fancy words to try and get your attention and hard earned money, it can be an overwhelming choice. There are times when being frugal is the right choice. But in our opinion, gloves aren’t one of them. Something that protects you from extreme heat should be made of only the most modern and well fitting of fabrics. It’s also important the gloves you decide on are fit for purpose. We’ve heard lots of complaints about gloves that were rated as high as 900° F causing burns because the user allowed them to get wet. It’s vital that you decide up front if you need water proof bbq gloves, and buy something like the Ekogrips or if it’s all about heat resistance, in which case the extreme heat resistant gloves above will do the trick. Last Updated: July 2018 We’ve researched the bbq glove market again in 2018 and added the Pit Glove Waterproof BBQ Glove to our round up of gloves. The rest of our selections still stand.